Can't attend? Follow imaginem Photography Walk to know of future events! 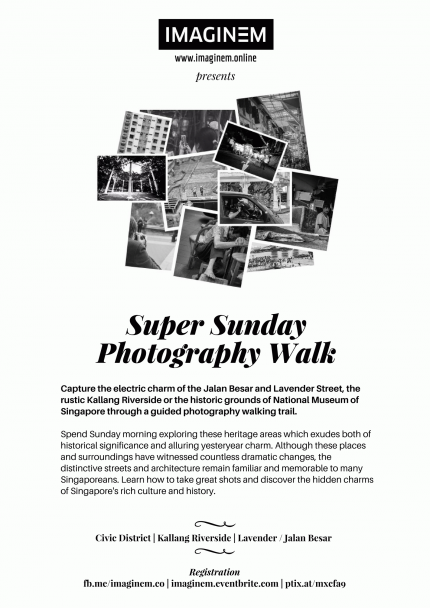 imaginem is delighted in organising an event series of Sunday morning walk with established photographers who will lead us to transcribe collective memories of our heritage through capturing impactful shots. Discover the hidden gems of the culturally diverse Jalan Besar heritage district, the scenic Kallang Riverside or the historic surroundings of the National Museum of Singapore. Registration will start at 945am in front of the museum counter, the walk will commence at 10am sharp. This is a rain or shine event - wet weather programme will be announced in front of the museum counter before 10 am as when necessary.